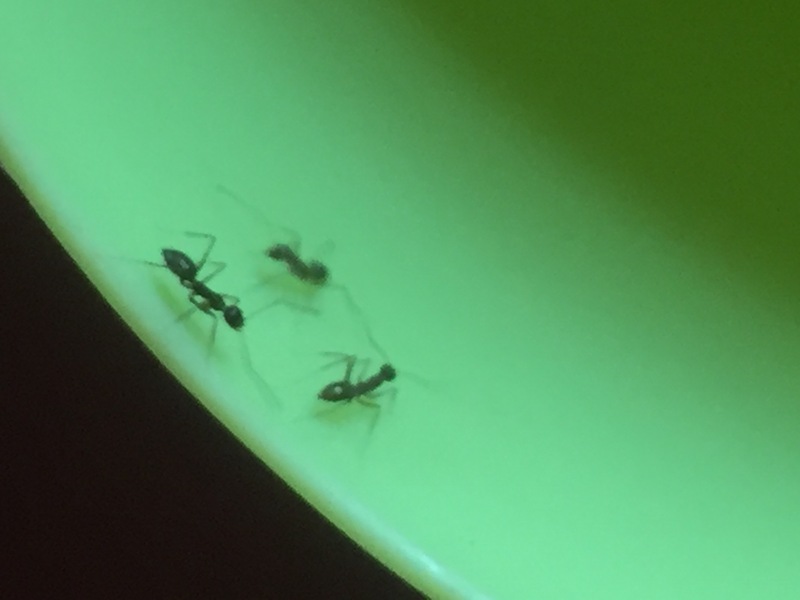 Operation Ant : this is war! We’ve got squatters, small six legged brown and black squatters and they’re starting to get on my nerves. I have declared war on the ants who think it perfectly acceptable to crawl into our apartment uninvited and have a party. We’ve had minor skirmishes before and managed to send them packing but this time they’ve come back, and they’ve got reinforcements. Every time I carefully go around the place collecting up any discarded juice cups, wrappers or crumbs and think I’ve successfully thwarted their attempts to take hold, I discover they’ve found a new source of nourishment and they’re back again! It just takes one stray crumb of bread missed by the dustpan and brush, a quarter of an oven chip dropped at the dining table, half a biscuit down the back of the sofa or a half drunk tumbler of juice and the little blighters have called all their mates round for a rave. I don’t leave food out to tempt them, the kitchen bin gets emptied regularly – I just don’t know why they’ve targeted us with their shenanigans. I guess it’s a price I have to pay for living in a warm climate, but I’m not happy about it! We’ve had a few insect related encounters during our time here in Gibraltar – by far the worst being cockroaches. In our first rental apartment, we saw them on a few odd occasions. The most revolting encounter was so traumatic that it actually cured me of morning sickness! I arrived home from the school run one morning very green and in need of a bacon butty (the only thing which would keep the symptoms at bay). As I lifted the glass lid over the stove, I found a big shiny cockroach sheltering underneath on the hot plates. All feelings of nausea evaporated to be replaced by utter disgust and anger that it had had the nerve to take up residence in my house. It must have flown in through the open kitchen window – it was soon flying back out again! My morning was then spent scrubbing and disinfecting everything. In our next apartment, it was moths that we took issue with. Not the kind which eat holes in clothes, the kind that can chew through plastic packaging and lay their eggs in pasta, rice, biscuits, cereal, yuck, yuck, yuck. We lost well over £100 worth of food in a store cupboard infestation and had to buy loads of new plastic storage boxes to keep all our food safe from them returning! I guess in comparison to our previous experiences, ants are pretty tame but I still don’t want them in my home! We’ve got history, me and the ants. We found them coming in through a loose tile on the balcony so I bought some time grout and Mr Postcard reattached the tile rendering their point of entry blocked. We went to bed that night feeling triumphant. What did we find the next morning? The little so-and-sos hadn’t just broken through the new grouting, they’d actually picked up the tile and moved it along so they could fit through again!! I’ve seen them come in from under the bath, above the bathroom door and through the window frames. I’m finding it hard to seal up all their entry points. I’ve used ant killing spray cans, bait traps, ant powder and Japanese oil of peppermint (as they don’t like the smell). All of them work to some degree but it’s an ongoing battle and I’m really not happy about using nasty chemicals so use them sparingly. I’ve done my research though this time and there’s a whole host of non-toxic items I can try out from flour to chalk, cayenne pepper to cinnamon, lemons, talc and white vinegar. I will not be beaten, I’m on the warpath and I will win my home back from these little menaces, just watch me! If you have any tried and tested methods of dealing with these little pests, please do share them. Thank you for all the kind messages I’ve received since my last post on Sunday regarding my little accident. I’m feeling much better now, my hobbling has improved and my bruises are developing a rather fetching green hue. Oh my !!! remind me never to get on the wrong side of you, as for the ants the cheeky little blighter’s !! !